Wills & Trusts Estate Planning & Settlement The Law Office of George M. Prescott Esquire Rhode Island does not have a procedure for the certification or recognition of specialization by lawyers. 300 Front Street, Lincoln, RI 02865 Telephone – 401.726.5577 www.GeorgeMPrescottLaw.com No fee for initial consultation. Mutter crosses finish line victorious 'I never felt we weren't going to be competitive,' says mayor-elect CUMBERLAND – As a com- petitive runner, Jeff Mutter knows that it's not always how one starts the race, it's how you finish. Mutter, who maintains that he was surprised by his win over incumbent Mayor Bill Murray in the Sept. 12 primary, said he was feel- ing the pressure leading up to election day. "In a campaign where your name is on the ballot, you just don't want to get crushed," he said. In running on roads, you win some races, "but most of them you lose," he said. As much as you tell yourself this is about trying and doing your best, losing is never easy, said Mutter. As he was pacing at Angelo's By ETHAN SHOREY Valley Breeze Managing Editor ethan@valleybreeze.com Azar revels in Town Council District 4 primary win LINCOLN – During primary day Sept. 12, Lincoln voters arriv- ing to the polls were greeted by heavy rains and the enthusiastic shouts of Town Council District 4 candi- date Pamela Azar, who split her time dodging puddles between her dis- trict's two polling places in pursuit of last-minute votes. At 7:50 p.m., she watched from the Twisted Hop Tavern as the final voters arrived at the precinct across School Street. "I was just staring at the voting building, thinking, 'another car, hurry, only seven minutes left!' " she said. About 30 minutes after the polls closed at 8 p.m., she realized she had won. Azar earned 75.4 percent of the primary vote, or 395 votes, easily beating opponent William Goho, who received 129 votes, or 24.6 percent. 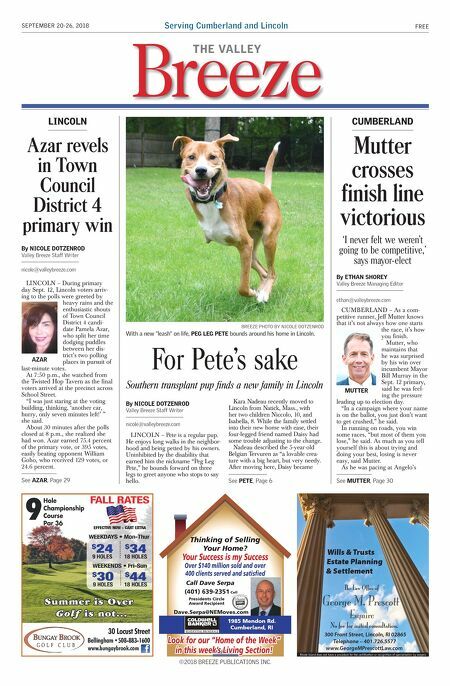 By NICOLE DOTZENROD Valley Breeze Staff Writer nicole@valleybreeze.com MUTTER See MUTTER, Page 30 AZAR CUMBERLAND LINCOLN For Pete's sake Southern transplant pup finds a new family in Lincoln LINCOLN – Pete is a regular pup. He enjoys long walks in the neighbor- hood and being petted by his owners. Uninhibited by the disability that earned him the nickname "Peg Leg Pete," he bounds forward on three legs to greet anyone who stops to say hello. Kara Nadeau recently moved to Lincoln from Natick, Mass., with her two children Niccolo, 10, and Isabella, 8. While the family settled into their new home with ease, their four-legged friend named Daisy had some trouble adjusting to the change. Nadeau described the 5-year-old Belgian Tervuren as "a lovable crea- ture with a big heart, but very needy. After moving here, Daisy became By NICOLE DOTZENROD Valley Breeze Staff Writer nicole@valleybreeze.com BREEZE PHOTO BY NICOLE DOTZENROD With a new "leash" on life, PEG LEG PETE bounds around his home in Lincoln. See PETE, Page 6 See AZAR, Page 29 ©2018 BREEZE PUBLICATIONS INC. Serving Cumberland and Lincoln Breeze THE VALLEY FREE SEPTEMBER 20-26, 2018 1985 Mendon Rd. Cumberland, RI Thinking of Selling Your Home? Your Success is my Success Over $140 million sold and over 400 clients served and satisfied Call Dave Serpa (401) 639-2351 Cell Dave.Serpa@NEMoves.com Presidents Circle Award Recipient RESIDENTIAL BROKERAGE Look for our "Home of the Week" in this week's Living Section!